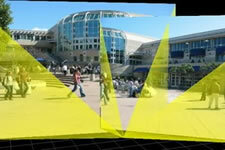 Computer scientists at UCSD have taken the wraps off a new technique for mixing images and video feeds from mobile cameras in the field to provide remote viewers with a virtual window into a physical environment. Dubbed ‘RealityFlythrough,’ the application constructs a 3D virtual environment dynamically out of the live video streams. On June 6 at MobiSys 2005 in Seattle, McCurdy presented a joint paper with Griswold about RealityFlythrough and a “systems architecture for ubiquitous video.” The third international conference on mobile systems, applications and services brings together academic and industry researchers in the area of mobile and wireless systems. Griswold and McCurdy are testing their new system as part of the WIISARD (Wireless Internet Information System for Medical Response in Disasters) project, which is funded by NIH’s National Library of Medicine. During a May 12 disaster drill organized by San Diego’s Metropolitan Medical Strike Team, the researchers shadowed a hazmat team responding to a simulated terrorist attack. They wore cameras mounted on their hardhats, tilt sensors with magnetic compasses, and global positioning (GPS) devices. Walking through the simulated disaster scene at the city’s Cruise Ship Terminal, McCurdy and Griswold captured continuous video to be fed over an ad hoc wireless network to a makeshift command post nearby. during the May 12 disaster drill in San Diego. Their solution: RealityFlythrough fills in the gaps in coverage with the most recent still images captured during camera pans. The software then blends the imagery with smooth transitions that simulate the sensation of a human performing a walking camera pan – even when one of the images is a still-frame. If older images are not desirable (e.g. in some security applications), the fill-in images can be omitted, or shown in sepia, or include an icon displaying how old the photo is. Human input is especially important indoors, where GPS cannot provide adequate location information. 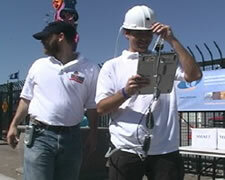 McCurdy carried a ‘dead reckoning’ device on his back during the May 12 disaster drill. The device uses gyros and other components to track body movement directions and footsteps from the moment the user enters an indoor area. McCurdy will work on refining the system for his dissertation. And if consumers start to show interest in RealityFlythrough, he holds open the possibility of starting up a company in 2005 to commercialize the technology for non-security markets. Computer science Ph.D. candidate Neil McCurdy explains why RealityFlythrough is a blend of tele-reality, tele-presence, and ubiquitous computing. Neil McCurdy discusses potential commercial applications for his new software, including virtual tourism. research video by Neil McCurdy about an earlier version of the technology.